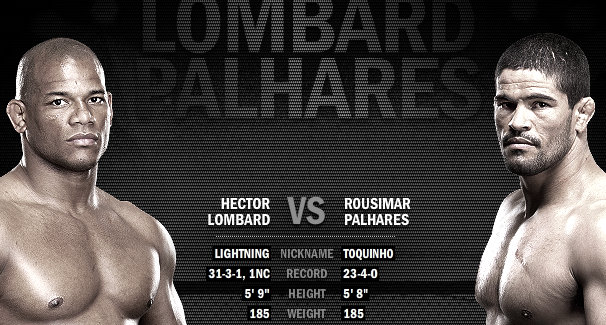 In the semi-main event of UFC on FX 6, leglock king Rousimar “Toquinho” Palhares will square off against Cuban wrecking machine Hector Lombard in a Middleweight showdown. Lombard was one of the most highly-regarded Middleweights outside of the UFC for years, but he fizzled in his UFC debut against Tim Boetsch. This is his chance to live up to some of the hype he brought into the Octagon with him, but Palhares’s leglocks are the stuff nightmares are made of, so he is going to have his hands full if he wants to avoid two losses in a row to start his UFC career. Hector Lombard, a former Olympic judoka, was considered the best Middleweight in the world outside of the UFC before his disappointing Octagon debut against Tim Boetsch. Despite his poor showing in that fight, though, Lombard’s resume is hard to argue with. He has solid takedowns and a decent ground game, but his best weapon is definitely his vicious power punching. Lombard throws with dangerous intentions, and if he lands a power punch there are very few fighters in the world who can handle it. There is no question that he is a better striker than Palhares in terms of both technique and punching power. His goal in this fight has to be to keep Palhares from taking him down or pulling guard. On the feet this fight will be a slaughter, but if Palhares can force it to the ground, Lombard might find himself in a lot of trouble trying to defend against leglocks. Rousimar “Toquinho” Palhares is a force of nature on the mat. His standup is rudimentary at best, and he isn’t the best wrestler in the division by any means, but he attacks the legs of his opponents with reckless abandon and has no equal when it comes to leglock and ankle lock submissions. It is imperative for Palhares to force this fight to the ground as soon as possible, because if he has to box with Lombard for an extended period he is going to get his head knocked off. On the mat, Palhares is on a completely different level from Lombard, and should be able to submit him if this one plays out on the ground for an extended period. Basically, this fight comes down to whether or not Palhares can force a ground fight. If he can effectively pull guard or take Lombard down, I don’t think he will have much trouble finding an opening for a submission. If he can’t, Lombard is going to put him to sleep with power punches. In the end, I think Lombard’s defensive wrestling and physical strength will be his biggest advantages. I think he should be able to hold Palhares off effectively, force a boxing match, and eventually catch Palhares for a T/KO victory. Prediction: Hector Lombard by second round T/KO.